The heart of doulaing is the relationship between the laboring person, their intimate family, and the doula who serves them. Through her clear use of language and vivid metaphors, Gilliland’s writing lingers long after you’ve finished reading her words. She outlines the true power in being a doula – to serve clients in a way that they are encouraged to become more empowered and authentic versions of themselves. Culling wisdom from over sixty birth doulas in Dr. Gilliland’s landmark research study, she promises to transform your relationship with clients and medical care providers alike. Anyone wanting to understand the complexity of the modern maternity care system and how to navigate the power structure in hospitals more effectively will gain from reading this book. 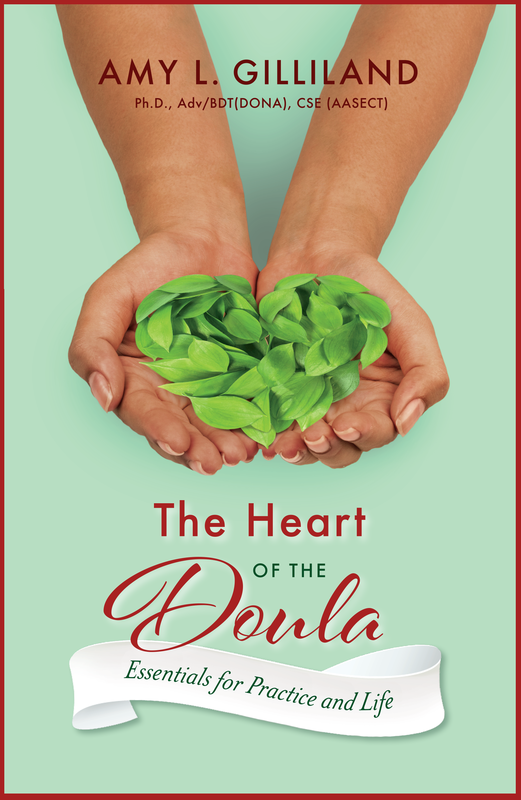 Heart of the Doula delves into the nitty-gritty reality of birth doula work in North American hospitals and the personal price many doulas pay to fill this highly important and beneficial role in people’s lives. In her triple roles as researcher, doula, and world class doula trainer, Gilliland’s insight is unparalleled. A must for anyone doing empowerment work, especially with people frequently disempowered in our care system. Get the book today on BookBaby! "Amy Gilliland is uniquely qualified to trace, explore, analyze, evaluate, and clarify the role of the doula in maternity care today. As a veteran doula and doula trainer she earned a master's degree and doctorate by interviewing doulas and parents over a period of 16 years, and documenting their impressions, challenges and concerns. The findings are sorted into 4 basic themes that reflect issues of great importance to doulas, parents, and those who work with them. Here is a sampling of the book's topics: competition and cooperation among doulas; relationships among doulas and nurses; difficult clients; sticky questions like whether to ask a client about history of sexual assault, or about fears or issues; what to do if the client seems to be making a bad decision or one that is contrary to what she had said she wanted; why doulas love their work despite its unpredictability and great demands; what qualities and services doulas bring to the birth that no one else brings; and MUCH more. Amy's skill in deconstructing the issues and analyzing the many opinions and interpretations that were expressed by interviewees helps readers broaden their thinking. After openly weighing the issues, Amy summarizes her conclusions and provides her reasoning. All doulas will not agree with all of Amy's perspectives, but will clarify their own understanding, and increase their confidence in performing their role. We are fortunate that Amy chose to study the relatively young doula profession. As we grow, this work provides clarity and guidance on what doulas really do and really should do! All doulas will benefit from this book. I can even picture it being used as a discussion guide for groups of doulas." Entertaining to watch – yes! Addresses different learning styles – yes! Increased our skill and knowledge level – yes! Brought us closer together as a group – yes! Amy delivered everything she promised and more!